Pokinacha had the most liked content! Luis at Alpine worked in Diepe as far as I believe. Sadly he has since retired and sold the business to a new owner, not one of his mechanics. yes. need the button that shows all the latest posts. I'm lazy and don't want to have to search/filter. Haha thanks! I actually think its the reservoir thats the problem. Will change it and see what happens. But all that aside, gorgeous car, drives very much like a meg225. Comfortable, economical and quite quick. I had a copper here in Canberra pull me over and after i'd talked my way out of a ticket, he commented that i wasnt a hoon in a hoon car. 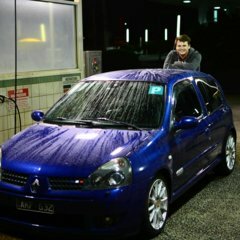 I was in the Clio with bonnet pins, on coilovers, semislicks, ktec stealth exhaust and ITBs under to hood. yes officer, i'm not a hoon at all... Previously I've been pulled over in my obnoxiously loud Alfa 156 GTA and no questions were asked about the noise or ride height. Just what the engine was. Sadly I don't think there is a lot of knowledge on the 175 on OZRS due to them being a bit of a rarity. They're not often tuned but I recall when they came out, there were only a few seconds off the RSM225 at Wakefield. As a package there isn't anything that comes close really and with a remap, DPF delete and a few tasty mods, you'd have a very quick car that runs on an oily rag. I had considered it, but my wife and financial adviser suggested that a newer car would be a better option. Plus i want recaros. Good Luck.